Raaga.com: Raaga.com Now Available on Chromecast! Raaga.com Now Available on Chromecast! Your favorite music, is available now on a bigger screen – on your TV SCREEN! Doesn’t that sound exciting? Wondering how? We are extremely happy to announce Raaga is now available on Google Chromecast! All you need is the $35 Chromecast device and TV with a spare HDMI port. Just plug it in and VOILA, the magic happens! Isn’t this a splendid way to be delving into ‘your own music space’ at ‘your own comfort’? Starting today, you can listen to all the music you want on Raaga.com using the Google Chromecast. Nothing to download or install. 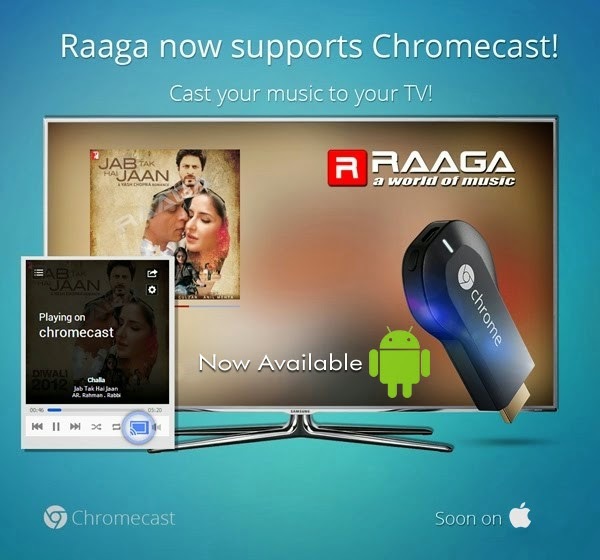 Just plug-in your Chromecast device and visit Raaga.com on your Chrome browser. If you’re on the same Wi-Fi as the device, the “Cast” icon will appear on the Raaga player. Just choose your preferred song quality in the player and listen to high quality music on your TV or home theater. You can also control playback of your songs sitting in any corner of your house! Chromecast is a sleek device from Google that turns any TV into a Smart TV! To know more about Chromecast visit the office website (http://www.chromecast.com). Raaga.com truly offering a ‘World of Music’ to all the listeners is happy to have taken this bold leap in technology, making it the first and only South Asian streaming service to be available on the device. We are constantly striving to gift the best music experience to all music fans, an opportunity to tune yourself to endless music, and that too in your favourite genre!